The post was authored by Emily Potts with contributions from Whitney Sherman. We asked Sherman for advice on how to draw. 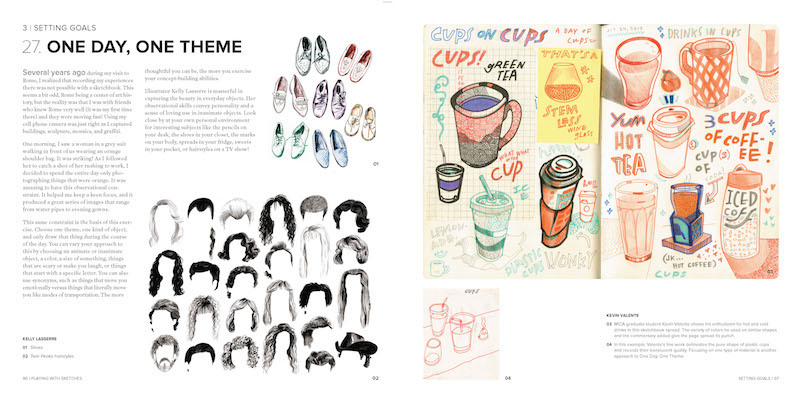 She also offers up five drawing exercises from her book to help anyone get started. If you’re looking for more resources on how to hone your design skills, check out our classes on Hand Lettering, Creating a Knockout Portfolio, Logo Design, and Photoshop tutorials. For creative people who are working in artforms that do not regularly encourage drawing, some of the reasons are the same – recognizing and celebrating native marks, but I think it goes a bit farther to include practice. Creatively leaning people continue drawing beyond childhood for longer than most, yet their particular area of creative focus as an adult may have not required the use of drawing, and so it is left behind, unpracticed. In both cases, having permission [from a teacher, from ones self] to draw as one does, to appreciate that and practice it will foster comfort and confidence with drawing. I had a drawing teacher in college who said, “Draw what you see, not what you know.” Do you find that holds true for everyone? Although I can’t say I know how everyone behaves, I do think that extended focus is very hard for most people. Numerous conditions and environments discourage this. Have you ever been bored because it feels like nothing is happening? If so, you are probably less likely to be able to focus on what is going on around you. The ability to quiet your mind and observe is central to the theme your teacher was addressing. Knowing involves conceptual thinking with additional abstract qualities based on memories of the circumstances surrounding the knowledge (Was there a smell in the air that caused us to form an opinion?). Seeing, on the other hand, requires that we participate with what is currently happening, and letting go of memory. Time is a key ingredient of seeing, although like many things, practice helps our seeing happen faster. If you purposefully act to see, you can then make the observations that allow you to translate your seeing into mark making. Anyone can doodle. It’s as simple as putting pen or pencil to paper and randomly sketching anything that comes to mind. Doodles come in any shape or form, and in any color. But don’t let the simplicity of this exercise fool you! Doodling increases your visual literacy and helps you process ideas, even when you are not trying! Experiment with different materials, and draw whatever comes to mind. You can also recruit your friend and co-workers to develop a doodle quilt using sticky notes in different colors. This exercise is based on a Surrealist game. Simply grab a sheet of paper—it can be a page from an old paperback book, or anything with markings—and place dots on specific words or letters. You choose what set of marks, words, or letters you want. Then connect the dots with straight, curved, or zigzag lines to create a pattern. These exercises reveal hidden patterns, show you how choices can make a difference, and will help you engage in randomness to take your work a few steps further. If you have been drawing for sometime and are feeling stuck or uninspired by your marks, it may be time to reinvent. Years ago I had developed a drawing method that involved rendering minute and exact details using graphite pencils on a fine surfaced drawing paper (Strathmore Drawing paper). I was bored, and so I set out to change my habit by using tools and paper that were the exact opposite—ink in a faulty dip pen on hot press paper, which is slightly spongy. I also used my non-dominant hand and no photo reference. This habit-breaking exercise lasted for a few months. It felt awkward and I didn’t expect anything massive to come from it, but it did! When I went back to drawing with familiar tools, I was breaking down the image in different ways and drawing with less restrictions. Choose one theme or one kind of object, and only draw that thing during the course of a day. You can vary your approach to this by choosing an animate or inanimate object, a color, a size of something, things that are scary or make you laugh, or things that start with a specific letter. You can also use synonyms, such as things that move you emotionally versus things that literally move you, like modes of transportation. The more thoughtful you can be, the more you exercise your concept-building abilities as well as you hand skills. Take 25 blank index cards and cut them into thirds. On the first stack, print an adjective on each card, on the next stack, print a noun, and on the third stack print a verb on each card. Shuffle each stack separately, then draw one card from each pile and put them next to each other, forming a phrase such as Devilish/Book/Laughing, and draw it. Drawing exercises like these are a great way to cultivate creative thinking. Looking for more ways to cultivate creativity and relieve stress? Join our new class: How to Draw. If you’re anything like me, you can never get enough good sketchbook ideas. I’m always looking for ways to engage students so that they truly want to work in their sketchbooks. 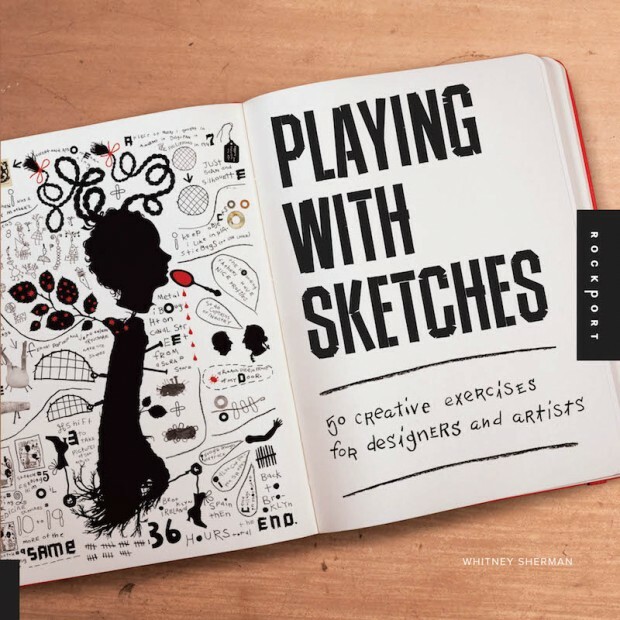 Whether you use sketchbooks for project planning, skill development, brainstorming, or something else, you’ll find ideas here that will work for you. My sketchbook assignments and prompts take an “all of the above” approach, making the following list well-rounded. The list covers many bases and is organized by category. There are prompts about animals, food, people, and other things that will spark interest among students. This list is geared toward secondary students, but you’ll find a lot here that will work for younger students as well. Take a look and see what will work best for you and your students. Add your own favorite sketchbook assignment in the comments below! Draw someone you sit by in an odd pose. Draw family members with things that are important to them. Draw yourself (or someone else) painting toenails. Find a quiet place in a crowd. Draw the crowd. Draw a relative by the light cast from a TV/Phone/Computer or other screen. Make a portrait of yourself in twenty years. Or in fifty years. Or both. Draw a masked man (or woman) that is not a superhero. Draw the ugliest baby you can imagine. Draw two sports figures–one in a dynamic pose, one in a static pose. Draw two self-portraits with odd expressions. Draw something or someone you love. Draw hair. A lot of it. Take a picture of someone near you on a bus or in a car. Draw them. Draw an animal eating another animal. Draw your art teacher in a fight with an animal. Draw an animal playing a musical instrument. There is an animal living in one of your appliances. Draw it. Draw a dead bird in a beautiful landscape. Draw something from a pet’s point of view. Draw an animal taking a bath. Draw an animal taking a human for a walk. Combine 3 existing animals to create a completely new creature. Draw a family portrait. Plot twist: It is a family of insects or animals. Draw the most terrifying animal you can imagine. Or the most adorable. Draw a pile of dishes before they get washed. Tighten a C-Clamp on a banana. Draw it. Draw a slice of the best pizza you have ever seen. Draw junk food and the wrapper. Create your own restaurant. Draw the restaurant, your executive chef, and a 12-item menu. Draw the ingredients or process of your favorite recipe. Draw salt and pepper shakers. Draw fresh fruit or vegetables, or something fresh from the oven. Draw the oldest thing in your refrigerator. Draw a piece of fruit every day until it becomes rotten. Draw everything on a restaurant table. Draw what is in the rearview mirror of the car. Draw moving water. Draw still water. Make a drawing of all of your drawing materials. Find a trash can. Draw its contents. Draw tools that belong to a certain profession. Draw three objects and their environments. One of the three should be in motion. Draw the interior of a mechanical object. Zoom in, focus on details and shading. Create three drawings of messes you have made. Draw five objects with interesting textures: wood grain, floors, tiles, walls, fabric, etc. Draw a collection of purses, wallets, or bags. Draw your favorite well-loved object or childhood toy. Draw a watch or another piece of jewelry. Draw something hideous that you keep for sentimental reasons. Draw something with a mirror image. 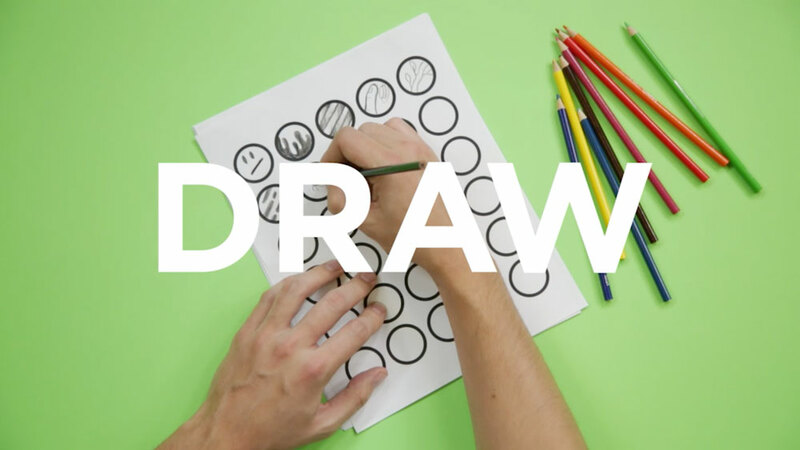 Draw all the contents of your junk drawer with one continuous line. Make a detailed drawing of a rock. Draw a dark object in a light environment. Draw a light object in a dark environment. Make a detailed drawing of five square inches of grass. Do several studies of eyes, noses, and mouths in a variety of poses. Draw an interesting object from three different angles. Value Studies–Draw three eggs and part of the carton with a strong light source. Draw three metallic objects that reflect light. Focus on highlights and reflections. Refraction–Create two drawings of separate objects partially submerged in water. Make three drawings (your choice of subject) using materials with which you are not familiar. Draw a piece of patterned fabric with folds. Draw a bridge and all of its details. Draw yourself as an original superhero. Make a drawing that looks sticky. Draw a mysterious doorway or staircase. Draw an empty room. Make it interesting. Draw a flower. Make it dangerous. Draw an imaginary place, adding all kinds of details. Draw a gumball machine that dispenses anything but gumballs. Danger! Draw yourself in a dangerous situation. You are on the back of the bus. Figure out who is with you, where you are going, and why. Illustrate and explain. Draw what’s under your bed (real or imagined). Draw the most incredible game of hide-and-seek you can imagine. Create a new sport. You can improve an existing sport, combine two existing sports, or come up with something completely new. Make a drawing that is totally truthful. Make a drawing that lies all over the place. Make a drawing that is completely and utterly impossible. Story Illustration: Fix a story that you don’t like, or reflect/improve upon one you do. Let someone else choose your subject and tell you what to draw. Use song lyrics, quotes, or poetry to inspire a drawing. Find the three most useless objects you can and draw them. Draw an interesting form of transportation. Draw something for which you are thankful. Go somewhere new and draw what you see. Draw something that can’t be turned off. Draw something you think sounds or smells incredible. Draw something that needs fixing. Draw something you’ve always wanted. Draw something out of place. Draw something that should have been invented by now. Draw something you keep putting off, or something that causes you to procrastinate. 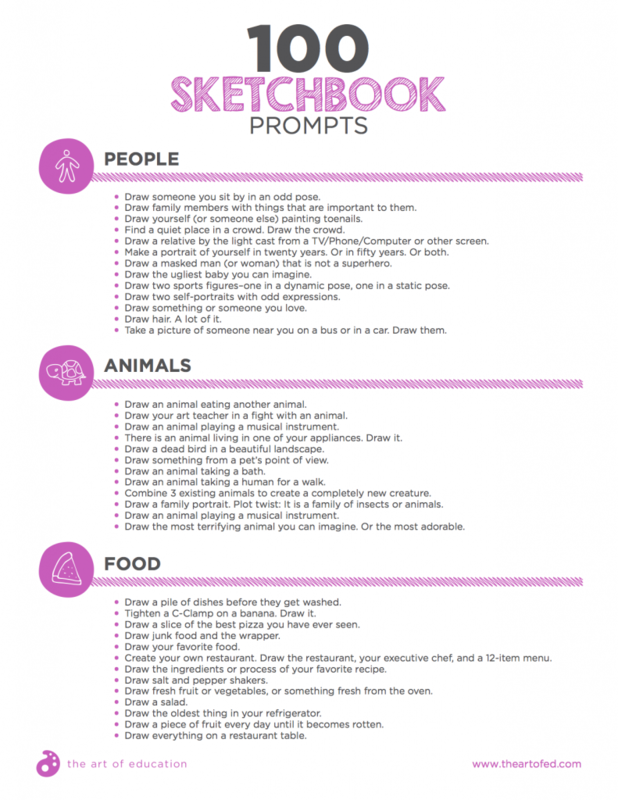 Does this list inspire you to take some sketchbook assignments head on in your art room? Or maybe the opposite is true and you are finding that you feel underprepared to teach drawing skills. Maybe you fall somewhere in between and you just need a little more inspiration to tweak your drawing curriculum. These are all great reasons to take a peek at AOE’s Studio: Drawing Course. The class is jam-packed with hands-on learning experiences, advanced technique tutorials, and opportunities to share and learn with art teachers just like you. What are your favorite sketchbook prompts to use? How do you use sketchbooks in your classroom?